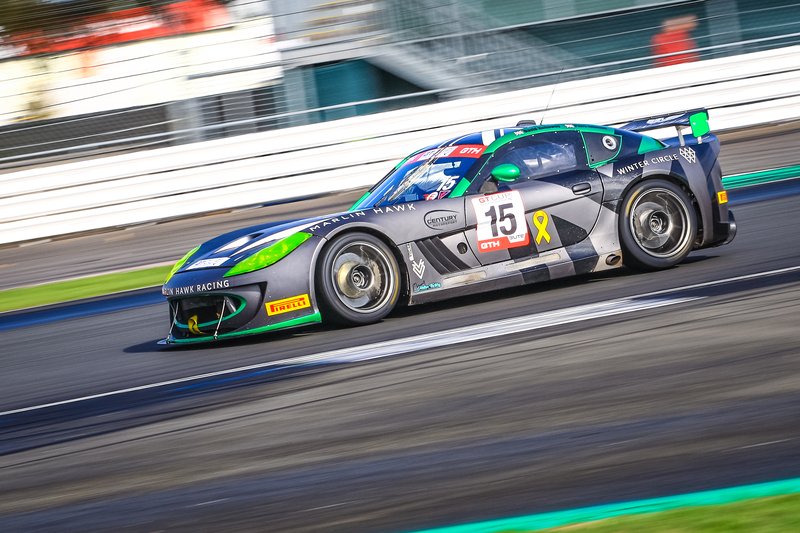 The final round of the GT Cup Championship was held at Silverstone circuit on 13th– 14th October. It didn’t quite go to plan, with treacherous weather causing the meeting to be abandoned before Sunday’s qualifying session and final race had taken place. All was not lost though, with David Holloway taking away two trophies from the final meeting. Also, having missed the opening round due to business commitments, Holloway did exceptionally well to finish second in the Championship (GTH Class) and seventh overall. Saturday morning was soaking wet for the practice session. In the afternoon, the qualifying session got underway on a drying track. Holloway posted the second quickest GTH time. The first race got underway later that afternoon. Holloway confidently held his second position until lap 6, where the #157 Aston Martin managed to find a way past. He then spent the remainder of the race close behind the Aston Martin, trying to claim back his second place spot but ended up settling with third place at the finish line. Early Saturday evening, the sky was darkening and race 2 got underway. Holloway got a really good start but then both Aston Martin’s came past him on the straight. He then fought hard to find a way past both cars. An amazing move into Club Corner saw Holloway storm past the first Aston. Then getting a really good run out of Luffield, he came side by side with the second Aston into Copse, where he managed to overtake and claim second position. It was then a very lonely race for Holloway as the GTH leader was far ahead and although Holloway had a few clear laps, he did not have time to catch the #72 Aston Martin that was leading. Holloway crossed the line at the chequered flag in second place, achieving his second podium of the weekend. Sunday morning saw torrential rain with heavy winds and there were delays on all track activity until the afternoon. Later on, the track was inspected again and it was deemed unsafe, forcing abandonment of the meeting. This meant that the final qualifying session and the final pit-stop race where Holloway was sharing his Ginetta G55 with teammate Piers Johnson, could not go ahead. Holloway finished the championship in a solid second place (GTH Class) and seventh place overall, which was an incredible achievement considering he didn’t take part in the opening round. Hopefully he will be back next year to add more trophies to his collection! “I’ve really enjoyed working with David and Century this season. David has stepped up to GT racing really well, adapted to the car and sharing it, along with coping with the longer races, and has really got stuck into racing hard and fair. We had 100% finishing record, thanks to Century providing a reliable race-car and us behaving ourselves, apart from my trip into the gravel at Oulton! “It’s been a thoroughly enjoyable year with David, Piers and Phil. It was a shame to have the last race meeting ended prematurely due to adverse weather, but we still went out on a high. It was clear that the Astons had an advantage around this power circuit and in race 2 David really got his elbows out and did some fantastic overtaking moves, showing just how much he has improved this year.